I have the second part of Pretty Jelly's Halloween collection to share with you today. These are 2 Halloween themed glitters that are right up my alley. I can never pass up a glitter! Both of these glitters are a unique twist to typical Halloween colors. contains shimmer like gold glitters that shift green. 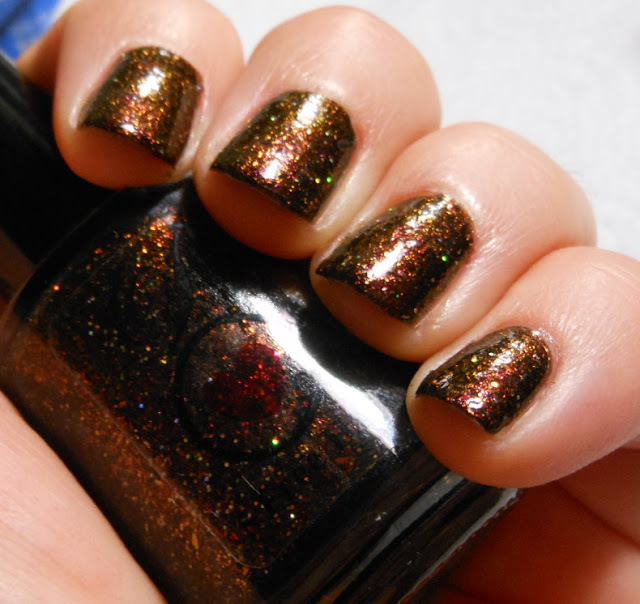 Color: These are great Halloween glitters. They're really fun takes on traditional Halloween colors. Pumpkin Carousel has the orange glitter and the black base, but it's filled with green, purple, and holo graphic glitters. 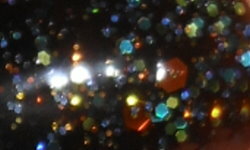 Werewolf Tricks is an amazing color shifting glitter. 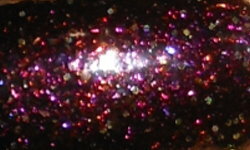 This is packed with amazing glitters that look more pink-purple or gold-amber dependent on lighting and angle. Formula: The formulas on both of these was good. I only needed 2 coats for each swatch. Pumpkin Carousel you may need some extra care getting those orange glitters out. They tend to want to stick to the sides, so let your bottle sit upside down for a bit will help. It also dries to a bumpy finish, so 2 coats of top coat would be idea. Werewolf Tricks was an easy breezy 2 coater that applied beautifully. Price: These are $10 each on the Pretty Jelly etsy site. Overall: I love these glitters. I love creative and thoughtfully made nail polishes and these both are exactly that. I love when makers create colors I couldn't imagine or think up myself. These are both fun and festive colors of Halloween and the fall season itself!